Sera Cahoone is a long way from home. Growing up the daughter of a dynamite salesman in the Colorado foothills, she got her start on the drums at 11. A year later, her skills had become so promising, her mom started taking her to dive bars to sit in with the scruffy old bluesmen. By the time she even picked up a guitar, she had been so shaped by these things the dynamite, the blues, the woods and the hills its no surprise she went on to earn a reputation as one of the strongest songwriters in Seattles ever-vibrant Americana scene. She moved north in 1998 to open a snowboard/skateboard shop but quickly found herself backing lo-fi outfit Carissas Weird on drums. Since that band split in '03, shes lent her sticks to folks as variant as Carolina rockers Band of Horses, Seattle blues chick Betsy Olson, and singer-songwriter Patrick Park. But in 2006 she struck out on her own with a self-titled debut which immediately scored praise from local and national tastemakers alike. Six years later (four since her widely acclaimed SubPop debut Only as the Day Is Long), Cahoone is readying the release of her third solo effort an album which sees her ruminating on the gravitational pull of home. Titled for the Colorado canyon where she came of age, where her mother still lives, Deer Creek Canyon delves deeper and sees her voice remarkably stronger than on her previous albums. Though some of the songs predate her move to Seattle, (she started writing Naked when she was 20 and finished it just before they hit record), its hard to miss the running themes of home. My brother and my sister both left and now theyve gone back home, she sings on the title track. Deer Creek Canyons where Im from and its where you are still. Rather than expound from there, she leans back and lets the music take over, Jeff Fielders guitar rooting strongly to the melodys foundation. Even the music isnt sure about wandering far from home. Sentimental, yes, but straight-forward. Where her previous efforts explored the complicated throes of dark emotions, this album is more richly focused. Home is even present in the more personal songs struggling with various facets of love and friendship (Worry All Your Life, Shakin Hands). I get really homesick and think about moving back to Colorado, she admits. But, Ive matured a lot. I took a very long break to write this record. I didnt care how long it took. Once these songs started coming together, I knew I wanted to take my time with this one. I wanted to get it right, focus more on production, and make sure all the sounds and vocals were pushed even higher. 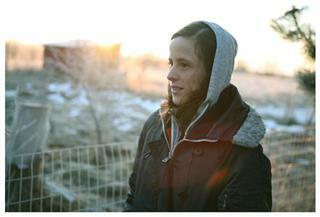 So, she co-produced the disc with Thom Monahan (Devendra Banhart, Vetiver). Recording began in Feb. 2012 at Bear Creek Studio in Woodinville, Wash., then headed to Monahans studio in LA for finishing touches. True to her sensibilities, she enlisted the talents of her long-time live band Jason Kardong, Fielder, Jonas Haskins, Jason Merculief, Sarah Standard plus Tomo Nakayama on piano and organ, and Emily Ann Peterson on cello. All these things contributed to Cahoone singing from a firmer foundation this time around, trusting the simplicity, bending against the elements like those trees in Deer Creek Canyon. Listen closely, you start to get the feeling. . . the music itself feels like home.